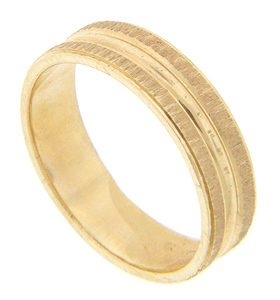 Double textured lines span the circumference of this 14K yellow gold estate wedding band. A smooth, polished center strip provides contrast to the texturing. The wedding ring measures 5mm in width. Circa: 1980. Size: 6. Cannot be resized.